likely to be enhanced to 97 TV channels and 40 Radio channels in near future. 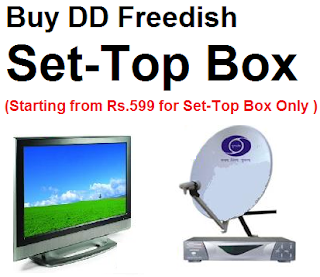 Doordarshan’s DD Free Dish primarily known as DD Direct + is a multi-channel Free to Air Direct to Home (DTH) service. This service was launched in December’2004 with the modest beginning of 33 channels. channels. 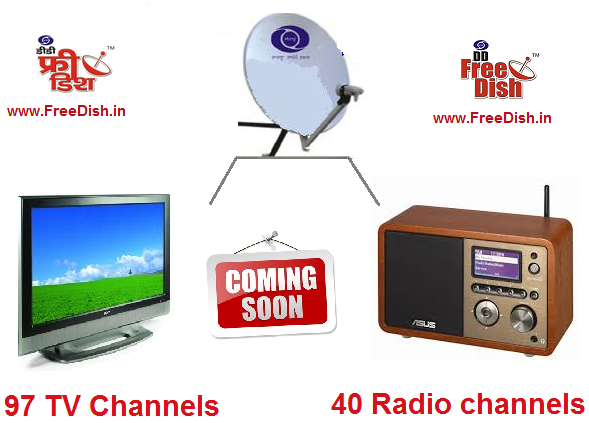 DD Free Dish is available in Ku-Band on INSAT-4B (at 93.5°E) having 5 streams of channels with Down-link Frequencies -10990, 11070, 11150, 11490 and 11570 MHz. This Ku-Band DTH service provides the TV coverage throughout the Indian territory (except Andaman & Nicobar Islands). DTH signals can be received through a small sized dish receive system( i.e. Set Top Box and Dish of size 60 to 90 cm in diameter) for which no monthly subscription fee is payable by the viewers. service can be received through a STB and small sized Dish Antenna. (approximately 120 cm diameter) for which also no monthly subscription fee is payable by viewers.